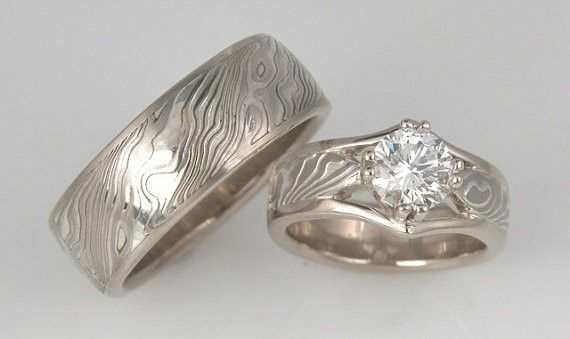 14k palladium white and sterling silver Mokume Gane two ring Wedding Ring Set. This style is created with a 14k palladium white gold lining and setting around the stone. Since this set is made to order, it can be created in other metal combinations as well. The Women's Mokume Gane ring is approximately 5mm in width, but width will vary with the size stone that will be used. The men's band is 8mm wide with 6mm of Mokume and 1mm sides framing the mokume. Special pricing is made if the men's ring is limited to 6.5-7mm in width since the mokume between the two rings can then be split from the same mokume gane billet. This design can be created in a variety of colors and a variety of stones. Please feel free to contact me to give me the specifications for what you would like. This listing is just for the Mokume Gane mountings. STONE IS SOLD SEPARATELY. The stone can be provided by you or one can be purchased by contacting the me, Debra. I am able to purchase any stone, but suggest Diamond, Sapphire or Moissanite (affordable lab grown diamond) for their hardness properties. The pictures shown are using a .72ct Diamond which is approximately 5.8mm. This example is of a medium random pattern and has an etched finish. The women's ring has not been darkened and the men's ring has been. Again, since this set will be made to order, you may change any element of the ring including etching. Please see sellers shop for more pattern examples. Delivery time is 4-6 weeks from time of payment. Patterns do vary so your rings will be truly unique. Customer service is very important to me, so please feel free to contact me with any questions and I will be happy to work with you!